Aww! 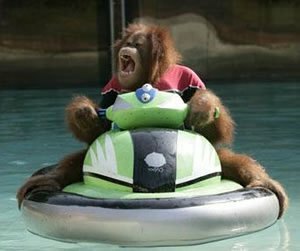 Suryia the Orangutan at T.I.G.E.R.S! 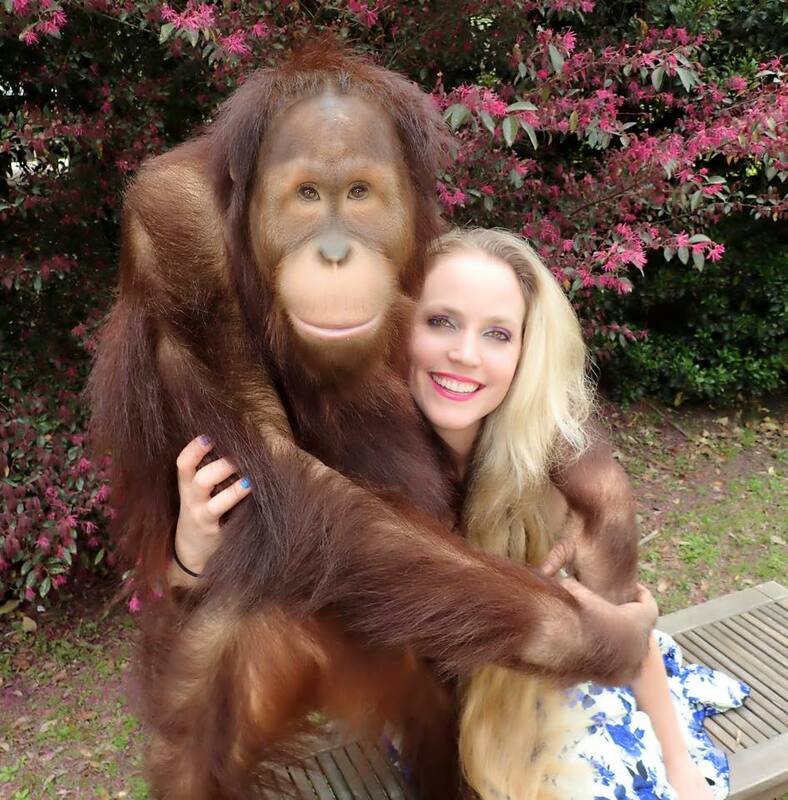 MYRTLE BEACH – Suryia is an orangutan and he has taken a liking to four new tiger cubs at the Myrtle Beach Safari preserve. The cubs are just about 2 months old and like cuddling and climbing all over the orangutan. Surya lives at The Institute of Greatly Endangered and Rare Species in Myrtle Beach, SC. Good Friday afternoon from T.I.G.E.R.S.! Would you like to see a one of a kind animal exhibit? 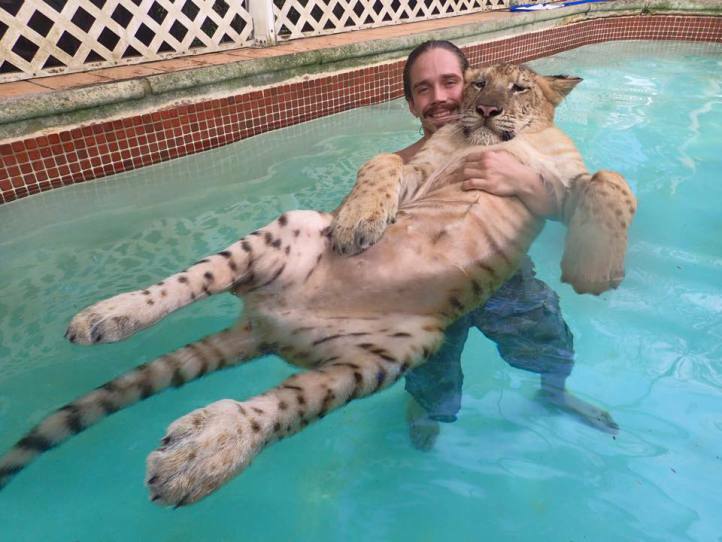 How about watching live exotic animals interacting with their handlers? The animals at T.I.G.E.R.S. and Preservation Station in Myrtle Beach are hand raised from the time they are very young. They are given thousands of hours of training and constant care by their individual trainers. We have such a strong relationship with the animals that recently we were able to go in the den box with one of the female tigers and assist while she gave birth to her cubs. One of the first things the baby cubs saw when they opened their eyes were their human friends. People often think it is dangerous to get so close to wild animals like these, but the handlers here at T.I.G.E.R.S. have been with these animals since they were cubs and have developed a special friendship based on love and respect. All of the trainers live with the animals 24 hours a day. T.I.G.E.R.S. has a proven method of dealing with these animals: Never treat them as pets; lots of tender loving care; and thousands of hours of one-on-onehandling. This training is beneficial to the animals in many ways. Please visit www.myrtlebeachsafari.com for more information on the T.I.G.E.R.S exhibit in Myrtle Beach, Endangered Tigers Species and the Greatly Endangered and Rare Species wildlife education organization. T.I.G.E.R.S. – Read what others are saying! Good afternoon again from T.I.G.E.R.S. in Myrtle Beach, SC!!! The staff would like to wish every one a safe and happy Labor Day weekend! I hope you enjoy the posts and comments you read here. 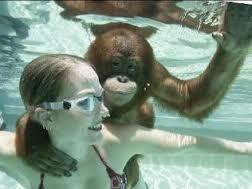 I have written about the animals; tigers, ligers, panthers, orangutans, and other exotic animals. I’ve also kept you up to date on the Director, Dr. Bhagavan Antle and the T.I.G.E.R.S. staff and their efforts and dedication to global conservation. Myrtle Beach attraction, T.I.G.E.R.S. (The Institute of Greatly Endangered and Rare Species) and the R.S.F. (Rare Species Fund) are based in Myrtle Beach, South Carolina. For more information, please visit www.myrtlebeachsafari.com. The phrase “Dog Days of Summer” describes the most oppressive period of summer, July through September each year. But where did the term come from? And what does it have to do with dogs? Many people believe the phrase stems from the fact that dogs tend to be sluggish during the hottest days of summer (aren’t we all? ), while others still say the days are so hot it causes dogs to go mad. But the name is actually a reference to the fact that, during this time, the Sun occupies the same region of the sky as Sirius, the brightest star visible from any part of Earth and part of the constellation Canis Major, the Greater Dog. This is why Sirius is sometimes called the Dog Star. tones muscles and builds strength provides an all-over body workout, as nearly all of your muscles are used during swimming. Come visit T.I.G.E.R.S. 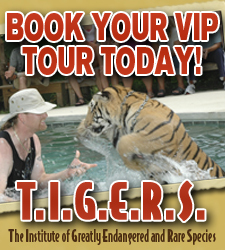 where you’ll meet tigers, wolves, leopards, chimpanzees, orangutans, and see tigers and apes swim! Greetings from T.I.G.E.R.S. in Myrtle Beach! It’s Friday and I can’t think of a better time to talk about T.I.G.E.R.S. So let’s go! I’ll bet you thought that a white tiger seems like a legend or myth right? The white tiger is neither a myth nor an invention, it’s a phenomenon of nature. You might have wondered what the white tiger symbolizes. The White Tiger is believed to have divine power to ward off evil, punish the evil and praise the good, bring wealth and good match for marriage etc. White tigers lack the pheomelanin pigment which is the same pigment that gives other tigers and humans red hair. They still have the pigment that allows them to have the black and brown coloration which prevents them from being considered albinos. The white tiger is a variant of the Bengal tiger, and are usually referred to as Royal Bengal tigers. Some white tigers have stripes that are so faint, that they appear completely white to the naked eye. Today, white tigers are being bred in captivity and several hundred now live in zoos around the world. Although you might think of white tigers being Siberian, actually there have not been any documented cases of white Siberian tigers found in the wild. To learn more about tigers, visit www.myrtlebeachsafari.com. Take the safari and have your picture taken holding a real tiger cub!!! Good afternoon once again from T.I.G.E.R.S in Myrtle Beach! Featured with Moksha in this amazing photo, Little Chin is one of three Asian small-clawed otters being cared for at the Myrtle Beach Safari in South Carolina. Born into captivity to help boost numbers and public awareness, 1-year-old Chin has been raised from a pup by her trainer, Moksha Bybee. 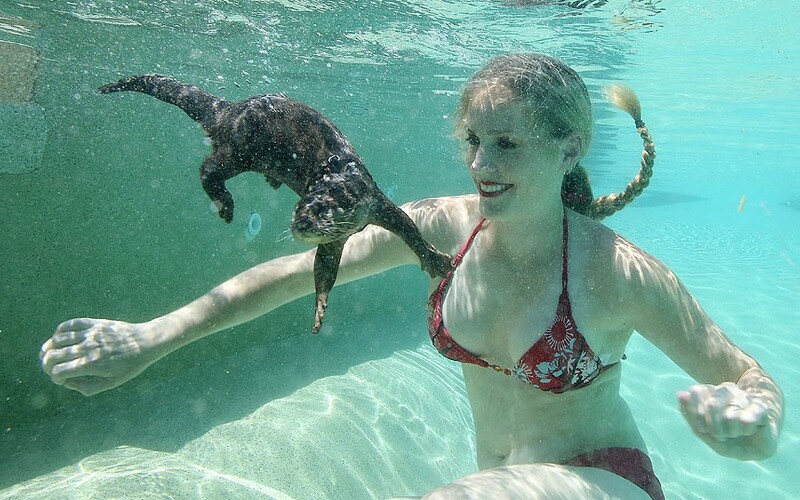 “I consider her to be my otter daughter,” said Moksha who walks and swims with Chin every day. The aquatic action takes place in a specially-designed 67,000 gallon pool which is big enough to give an elephant a few laps. “Chin rides on my shoulder and I have a little harness to keep her safe because otters can be very slippery on land,” added Moksha. The lovable river mammal loves to eat minnows, tiliapia fish, trout and a specially made feed called “otter chow”. Moksha says, “She sometimes likes to eat a hard boiled egg and her favorite toys are a red rubber ball and a bell”. Named after a river in Asia, Chin may look like the perfect companion, but only a trained professional should care for her. 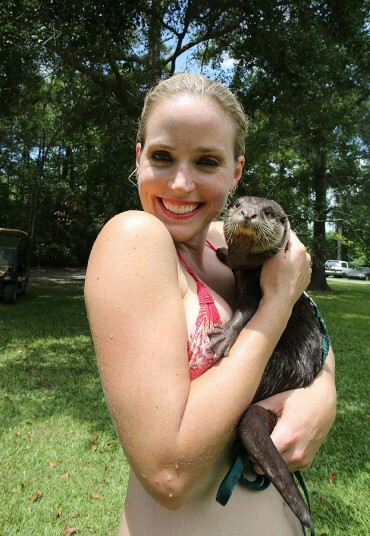 According to Doc Antle, Director of the Myrtle Beach Safari, “otters only bond with one or two people and should not be kept as pets at all. They are prone to biting people they don’t know and they have extremely strong jaws and sharp teeth. Little Chin has this cute little face but if she bit you, it could be 50 stitches before you know it! Their bite is as bad as a large dog’s bite”. Known for their dexterity, small-clawed otters are facing possible extinction is Asia due to deforestation and pollution in the rivers. Scientists call them “indicator species” because the entire ecosystem is connected to the health of their population. Small-clawed otters are the tiniest of all the otter species. The largest is the giant otter or “river wolf” of the Amazon. The giant otter is an endangered beast that can grow up to 5 1/2 feet long and weigh 75 pounds. For more information about T.I.G.E.R.S, visit www.myrtlebeachsafari.com. T.I.G.E.R.S – Get started on your own interactive tour! Good Friday afternoon from T.I.G.E.R.S! You can learn more about the many programs supported by the Rare Species Fund while experiencing your own interactive and educational tour. We are in the final weeks of our 2014 season. Our season ends mid-October and reservations need to be made NOW! As you can imagine, the final weeks of our Myrtle Beach Safari tours are filling up FAST. Book your family’s tour today for an unforgettable hands-on experience. T.I.G.E.R.S. Preserve and T.I.G.E.R.S. Preservation Station were created as a wildlife education organization dedicated to promoting global conservation. With informative, educational and entertaining interactive programs, Dr. Bhagavan Antle has created a once-in-a-lifetime experience! Dr. Antle, Director of T.I.G.E.R.S., works closely with international wildlife conservation projects in North America, South America, Africa and Southeast Asia. Learn more about conservation efforts for chimpanzees, lynx, elephants, tigers, ligers, orangutans, gibbons, apes and more through the Rare Species Fund. To see these amazing species up close and personal, visit www.myrtlebeachsafari.com/signup to get started on your own interactive tour! To make reservations over the phone, please call 843.855.2699 or click here. Hello again from T.I.G.E.R.S. and Preservation Station in Myrtle Beach! Most don’t realize that many living species on Earth are at risk of being endangered or going extinct. 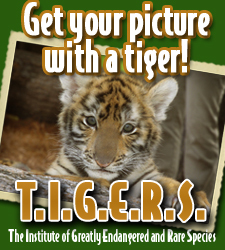 T.I.G.E.R.S.,(The Institute of Greatly Endangered and Rare Species) is a wildlife education organization, dedicated to promoting global conservation with informative, educational and entertaining interactive programs. The RSF (Rare Species Fund) was established to provide funding to critical on the ground international wildlife conservation programs, thereby complimenting the educational messages and field research of T.I.G.E.R.S. The Fund receives its financing base through a percentage of revenues taken in by T.I.G.E.R.S., the generosity of donations from exhibit guests, and the general public. The Center for Biological Diversity wants the desert kit fox to be placed on California’s threatened species list, citing concerns about the animal’s habitat and health due to large-scale solar and wind development. The center — a national nonprofit group dedicated to preserving wildlife — filed a petition Monday with the California Fish and Wildlife Commission, asking that the animal be classified as threatened. The petition specifically cites the 2011 outbreak of canine distemper at NextEra Energy’s Genesis solar project — under construction east of the Coachella Valley — as one factor triggering the need for better protection of the animals. The desert kit fox, which weighs in at 3 to 6 pounds, is considered one of the smallest wild canine species. It is unique to the Southern California desert, with a range extending from Inyo County in the north to Imperial County. The exact number of desert kit foxes in the region is unknown. Make a difference! Do something good today! Join us, Support T.I.G.E.R.S. and Endangered Wildlife Species. T.I.G.E.R.S. – Enjoy these TIGER facts! The gestation period for tigers is 100 days, but ranges from 93 to 111 days. After this time she will give birth to a litter of between 1 and 7 blind cubs, the norm being 2 to 4. Wild females give birth once every 2 to 2.5 years. The interval between births is approximately three to four years, though should a litter of newborns die, a tigress is quite capable of producing another litter within only five months. The mortality rate for wild tigers in the first two years of life is very high — at least 50%. Estimates consider that only one cub from each litter survives to maturity. An interesting comparison can be made here between the lion and the tiger. Lionesses have other pride members to protect cubs and to help hunt. If a lioness dies the pride will usually continue to provide for her cubs. A tigress lacks this benefit and the cubs are at the mercy of any predator that wanders past. Some of the animals that would attack a cub are jackals, hyenas, wild dogs and the python. Other causes of death include fires started by villagers; these are done to clear land for grazing, or to increase fertility. Once they become out of control they can destroy large tracts of forest and it is not uncommon for dead cubs to be found outside their dens soon after. Poachers are more than happy to kill cubs for their highly prized body parts and those valuable coats. On average tigers will live for 10 to 15 years out in the wild and 16 to 20 years in captivity, though there is one Australian tiger recorded as living to the ripe old age of 26. I hope you enjoyed these facts. Please visit www.myrtlebeachsafari.com for more information on the T.I.G.E.R.S exhibit in Myrtle Beach, Endangered Tigers Species and the Greatly Endangered and Rare Species wildlife education organization. T.I.G.E.R.S. – Endangered species up-close and un-caged! Good morning from T.I.G.E.R.S.! Would you like to see a one of a kind animal exhibit? 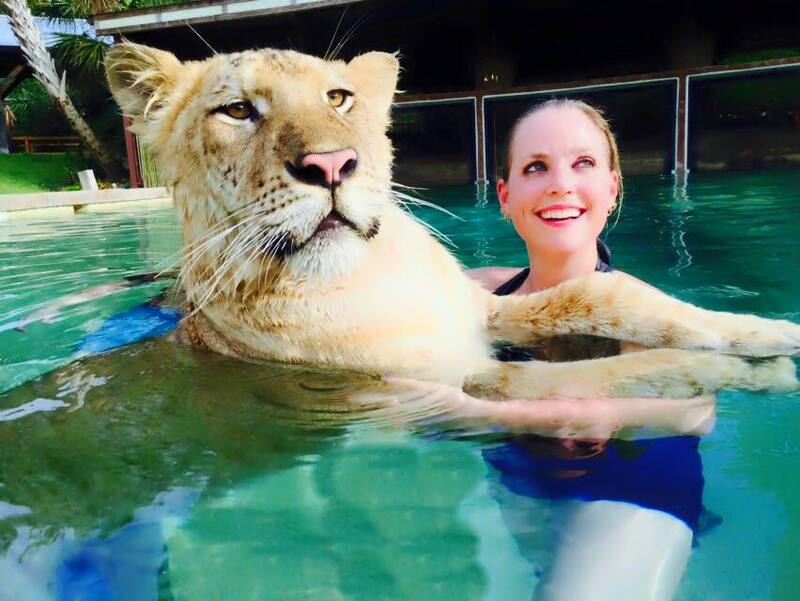 How about watching live exotic animals interacting with their handlers? T.I.G.E.R.S. has a proven method of dealing with these animals: Never treat them as pets; lots of tender loving care; and thousands of hours of one-on-one handling. This training is beneficial to the animals in many ways.